“But wait!” you might be saying, “That game was never commercially released in the U.S., only in Vs. and Playchoice 10 arcade units!” And you would be right. 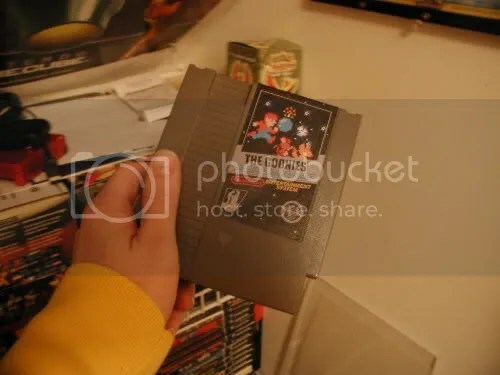 However, these days it’s easy to get old unreleased games burned onto an actual cart; I’ve actually got several fan translated and custom homebrew games on cart… someday I might post about them here. Until then, it’s fairly simple to find places to get them online… just do a search for nes reproductions. But that’s not what this post is about… let’s talk about the first Goonies game! You’ve probably played the sequel, and for the most part, the first game is the same. 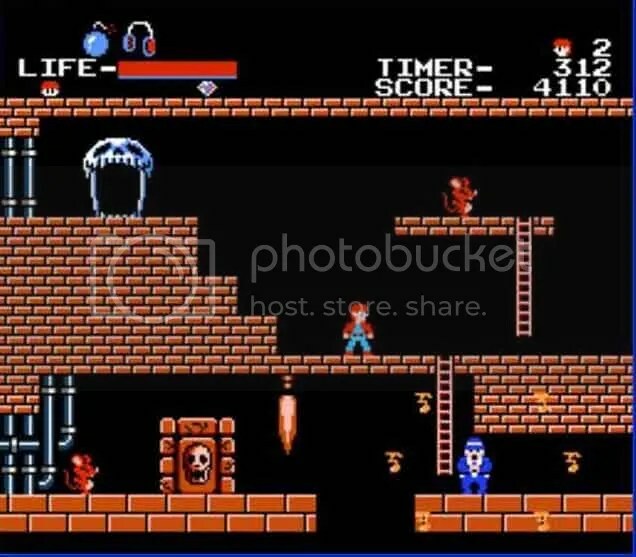 You guide Mikey on a quest to rescue his pals and avoid enemies such as giant rats and the Fratelli gang. However, the game is much simpler… instead of a giant map to explore, the game is divided into stages. In each stage, you’re tasked with finding three keys and a Goonie, which are hidden behind doors. How do you open the doors? Well, with bombs, of course. How do you get bombs? Well, duh, kicking RATS of course. I’m not sure why bipedeal rodents would be carrying around bombs, but if I try to find the logic of everything in this game, we’ll be here all day. With the exception of the first and last stages, each stage has separate segments to explore and numerous pitfalls and baddies to avoid. There is also a strict time limit, and if you fail to find the keys and reach the exit, you’ll lose a life. The game is only six stages long, so the real goal of the game is to earn a high score. Otherwise, the game is incredibly easy, due to a couple of different factors. As you go through the game, you can gather hidden items, such as a helmet and a bulletproof vest, which make you basically invincible to enemy attacks. And though you only have three lives, the game features a very generous continue code that not only puts you back on the stage you died on, but at the exact spot you died, along with all of your items. Simply hold Up and A on the Game Over screen and press Start. I played through the more complex The Goonies II earlier this summer… for the first few hours I attempted to play on my own, but after getting myself hopelessly lost, I did what any sane modern gamer would do… I printed out a map from GameFAQs. Even with the map, it took me an afternoon to get through the game. I plowed through this game in half an hour, and only had to continue once. But, I actually prefer this game to the sequel; it’s one of those games you can pick up and play without having to invest a lot of time to search for items and do-dads and figure out the confusing map layout, not to mention having to suffer through those lousy and obscure first person segments. And I think the graphics are actually better in this one too… Mikey looks more like his movie counterpart instead of some little punk in a blue tank top that the sequel depicted him as. Nearly twenty years ago I encountered this game in a PlayChoice 10 machine outside some hotel during a family summer trip through the northeast, but being without quarters I could only watch the attract mode and yearn to play it. Now, finally able to play it two decades later, I can say the wait was worth it. You are currently browsing the Game Blog of AWESOMENESS blog archives for December, 2010.